Aren’t these so cute?! I would love to have one that goes with every outfit… Which one id your favorite? 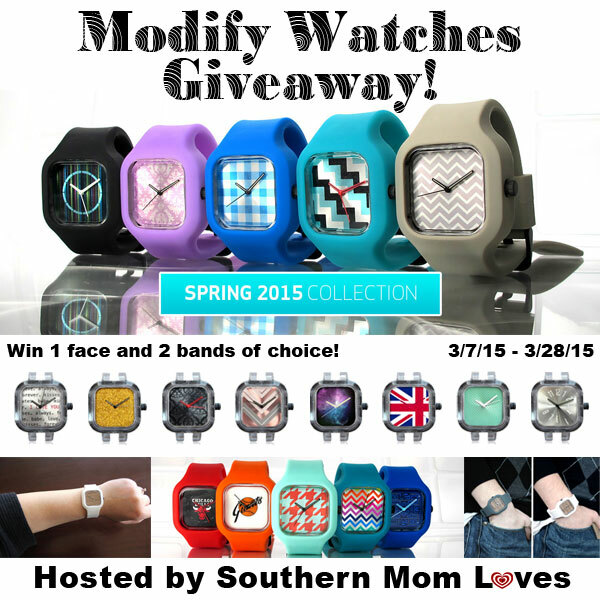 Modify Watches is generously sponsoring a giveaway for the same items she received! One lucky reader will receive 1 watch face and 2 bands of their choice (in the “sport” size)! Holly chose the Eldorado wood face with white and grey bands. Which will you choose? Disclaimer: The participating bloggers were not compensated for this post. No purchase is necessary to enter. One entrant per household, per address. All entries will be verified. Void where prohibited by law. Winner will be contacted by email and have 24 hours to respond before a new winner is chosen; Please add southernmomloves@gmail.com to your whitelist. Modify Watches will be responsible for prize delivery to the winner. This giveaway is in no way administered, sponsored, endorsed by, or associated with Facebook and/or Twitter, Google, Pinterest, or any other social media platform.